Parties don't get much better than this. I got to meet a legend (Anita Silvey), and a community organizer (Eisha of 7-imp fame). 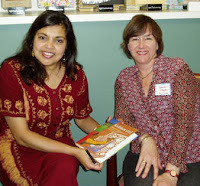 I got to deck editor Judy O'Malley (don't stop reading the sentence there, please) in a saree — to see us in action, visit Unabridged, Charlesbridge's blog — and draw dragons eating their tails (as instructed by Ralph Masiello). And I got to talk about Rickshaw Girl and sign books with my collaborator, illustrator Jamie Hogan (see below). Thanks, Charlesbridge!